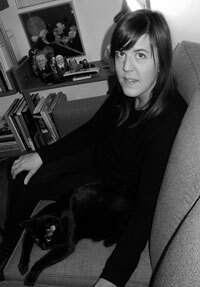 Meredyth Sparks enjoys exploring the zone between figuration and abstraction across a variety of subjects for which a plethora of images already exists: musical subcultures (bulimic in the idolatory-image department), the historical avant-garde and what she calls the “ever-evolving legacies of labor and gender-based issues”. 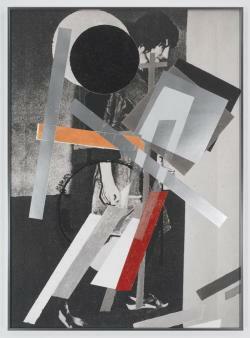 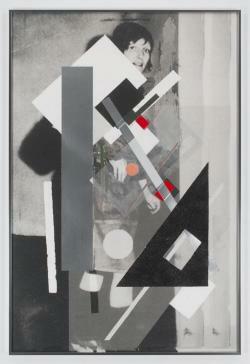 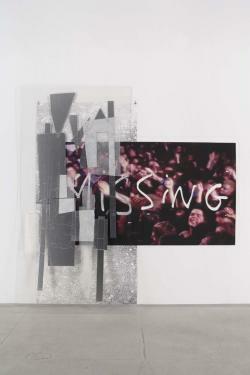 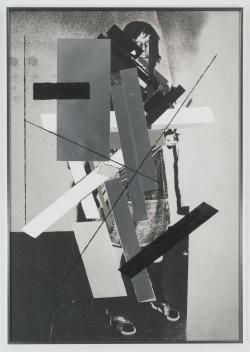 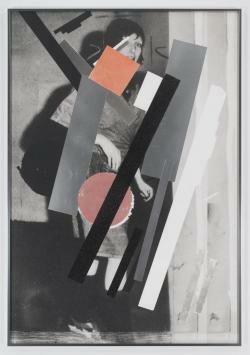 Like a number of her fellow artists in Out of Focus, she allows her works to step out of conventional frames and spill across floors and walls in quasi-Constructivist style, following El Lissitzky’s realization that the picture frame had become too narrow for representations of ‘the new reality’. 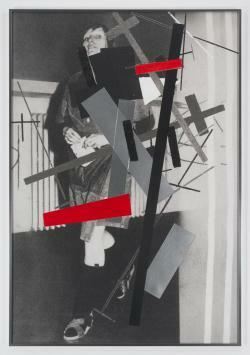 El Lissitzky was diametrically opposed to the absolutely non-utilitarian Suprematism of Kasimir Malevich, whose spirit returns in Sparks’ Gudrun Constructed to engage in ideological battle with Gudrun Ensslin, a founding member of the violently revolutionary Baader-Meinhof Gang. 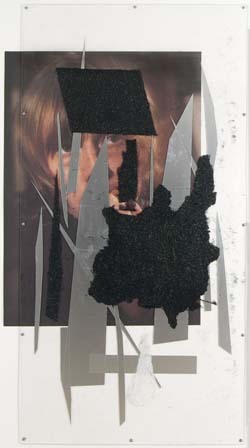 Sparks combines Malevich motifs, photographs, vinyl, aluminium foil and glitter (which I take to stand for the seductive, even hypnotic power of all photographic imagery) to create a part-digital, part-physical, five-section collage that reads almost cinematographically, but like a snippet of film, recalling collagist Paul Nash’s observation that “The more the object is studied from the point of view of its animation, the more incalculable become its variations; the more subtle becomes the problem of assembling and associating different objects in order to create that true irrational poise which is the solution of the personal equation".